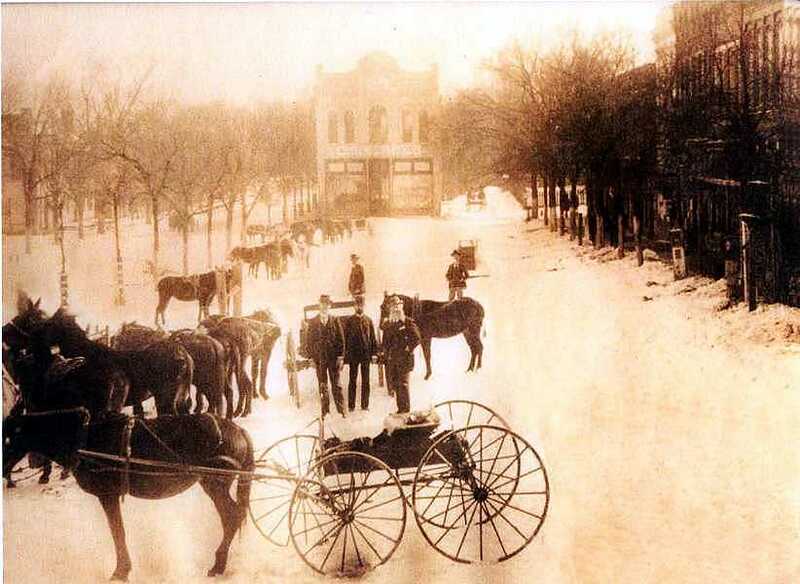 This is a wonderful picture made in the downtown square in the 1890s. Abbeville doesn't get much snow, so this should have been an interesting day back then. The building which I always knew as Lomax Hardware is at the top center of the picture. 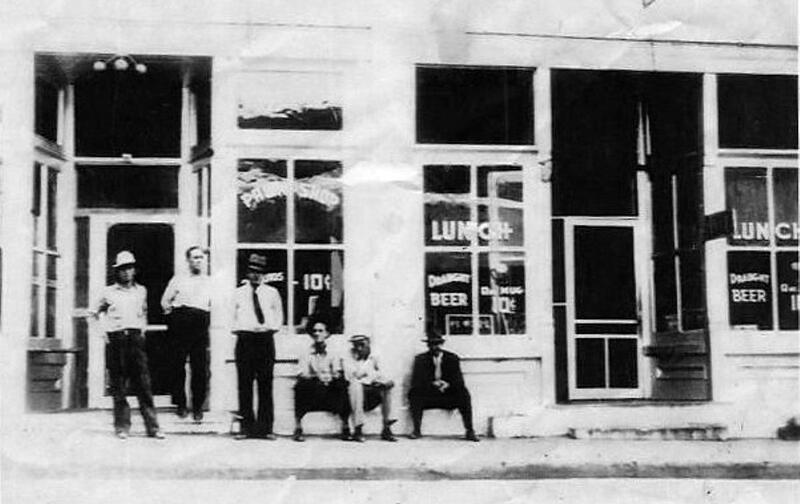 White's Grocery and Dry Goods occupied the building when the picture was made. A powder magazine from the Revolutionary War period was in an open space on the right side of White's store. When I was growing up, the Cooperative Grocery and the Press and Banner offices had been built in this space. I never remember the trees in front of the stores on the right. It looks like their branches are touching the buildings. The central area of the square on the left does not look like it has been landscaped as it was when I was growing up. All the snow that has been shoveled out of the street was probably shoveled by hand. And the gentlemen in the picture are all wearing three-piece suits with a hat. Wow, how things have changed. 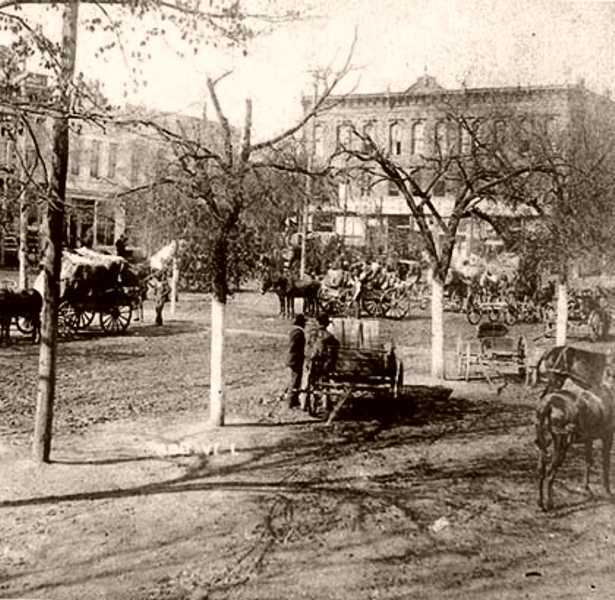 This is a very early picture of the square. The building at the center right would later become Poliakoff's Department Store. This is a picture from 1915 made in front of the Opera House. 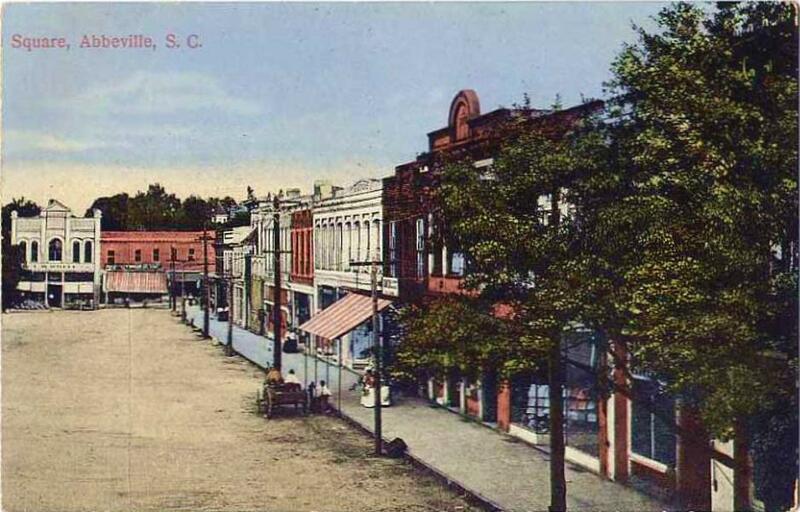 Picture from the 1910s made on the square. This is a beautiful color picture of the square made in about 1909. 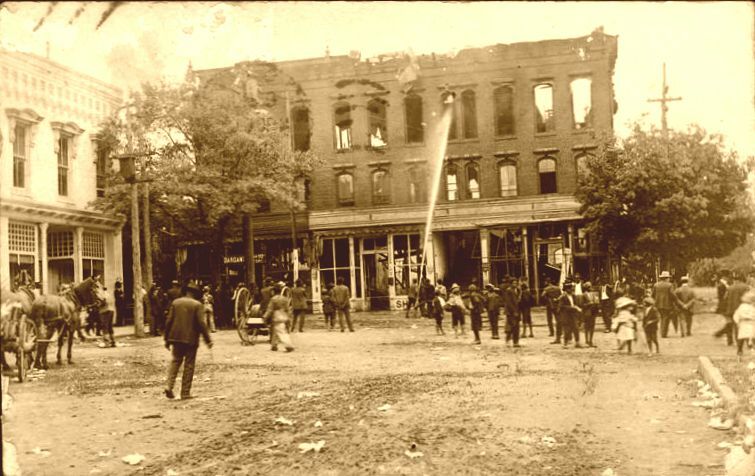 Picture of a 1908 fire on the square. The burning buildings would later be the home of Blake's Cloth Shop on the right and Belk-Simpson's on the left. On the evening of December 23, 1960, Belk's burned again. Belk's reopened the next day in the vacant Kerr Furniture Store on the North Main St. extension of the square to handle the Christmas lay-aways. Cooper Furniture Store on the North Main St. extension behind Belk's also burned. 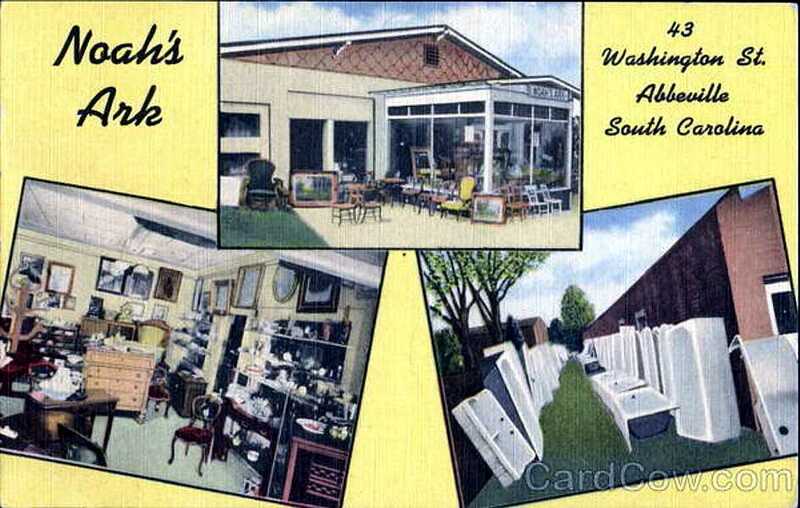 The second floor of Cooper Furniture was the Belk's Bargain Department and lay-away storeroom. It was connected to the main store by an enclosed bridge that went over an alley between the two buildings. 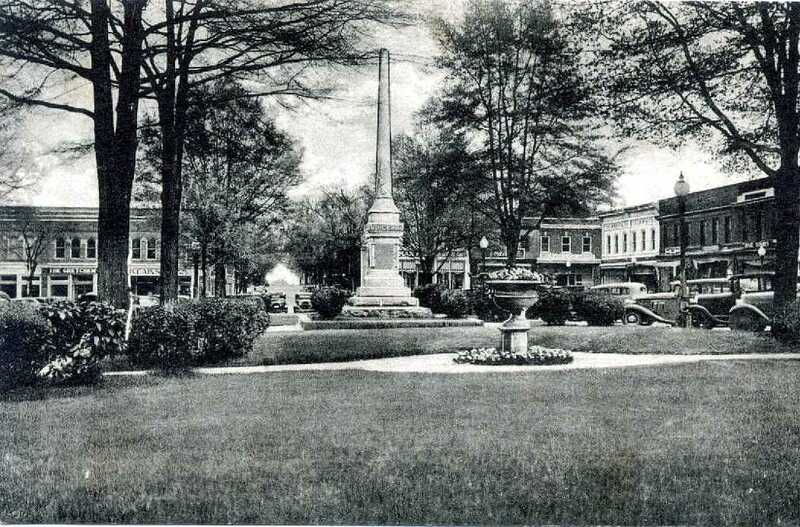 A pre 1920 picture of the square. 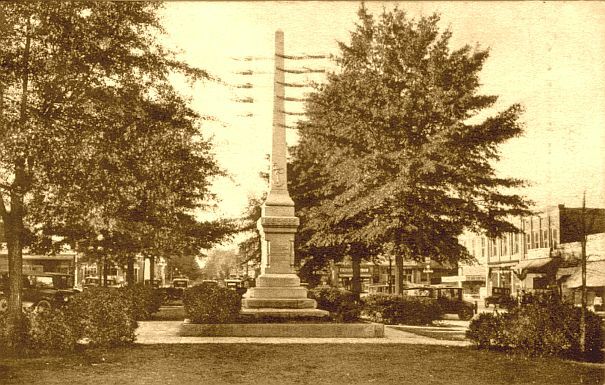 The name in the lower right hand corner is "The McMurray Drug Co."
A 1935 postcard picture of the Confederate Monument. A very nice postcard picture of the Confederate Monument that may have been made around 1940. The cars all look to be 1930s cars. 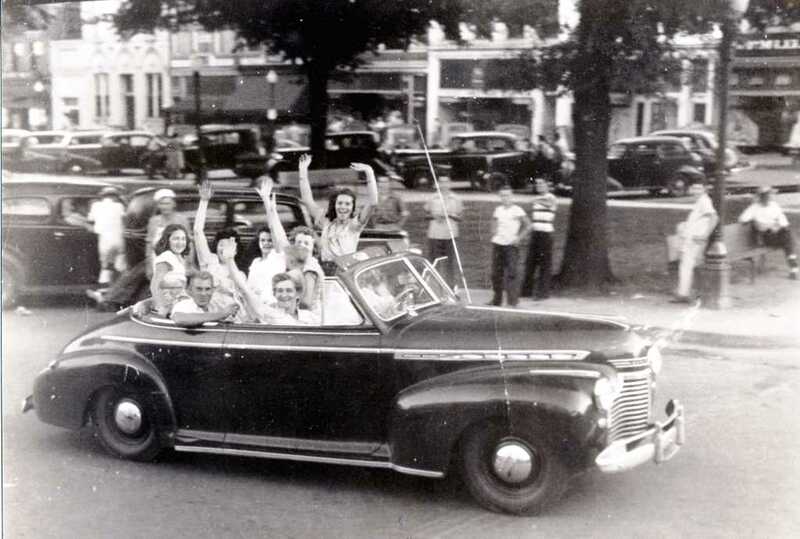 There were no cars made in the US until World War II ended, so the photo could have been made as late as 1945. The back of the post card says "McMurray's Drug Store." The picture is made from the north end of the square. 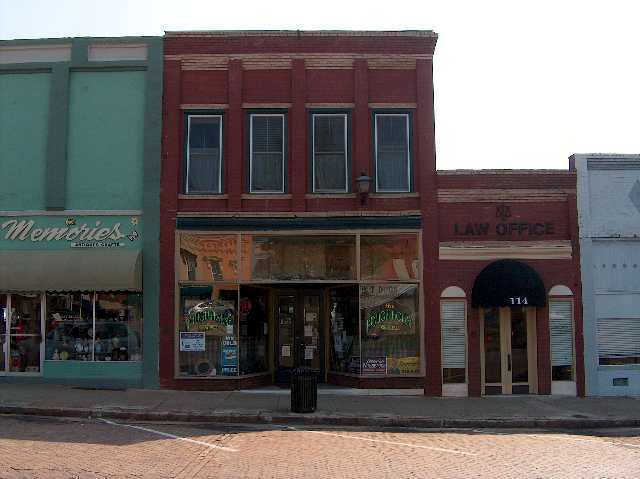 Above the stores at the rear of the square is "The Gretchen Grill," "MCcain's Motor Service," and "Lomax Hardware." The original monument. I believe this picture was made in the 1960s. This picture looks like it may have been made sometime during World War 2. My grandmother had a 1940 Chevrolet, and I remember it looking newer than any of the cars here. Before I was in grade school, I remember my father having a '36 Plymouth which had a back that looked sort of like that on the car in the extreme lower left. So this picture must be from the latter '30s or early '40s. 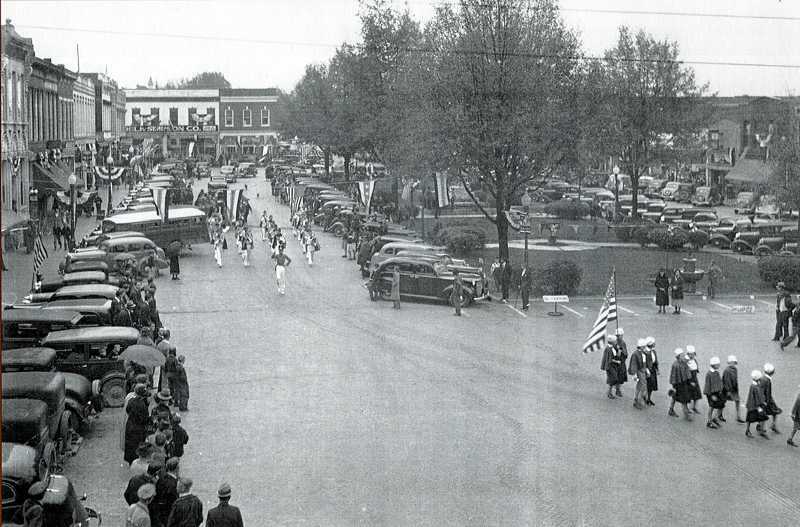 From the flags, it looks like they are holding some sort of patriotic parade. I can see Belk Simpson Co. on the building in the upper left. Notice how neat the central area looks. That is the way I remember it as a kid. There is a round marble horse watering trough at the lower end of the central area. I remember this as a kid, but I never remember any horses on the square. Notice the number of cars around the square. I remember so many cars that it was often difficult to find a place to park. Before Christmas, the retail business was so brisk that often there were so many people on the sidewalks that it was difficult to walk. 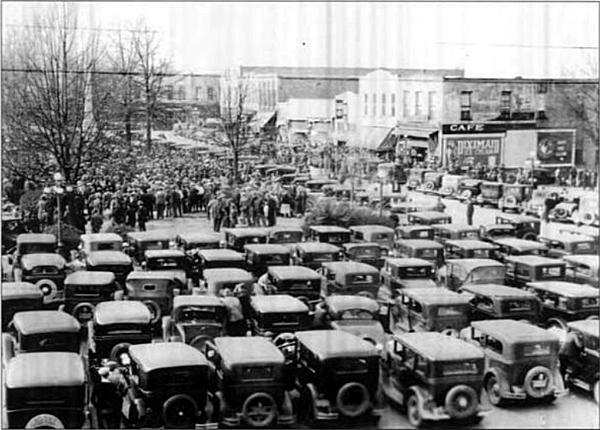 A picture of the square made on a Saturday morning in 1929. Look at the crowd of people. Now, almost no one is on the square on Saturday mornings. Made on the square at the end of World War II. 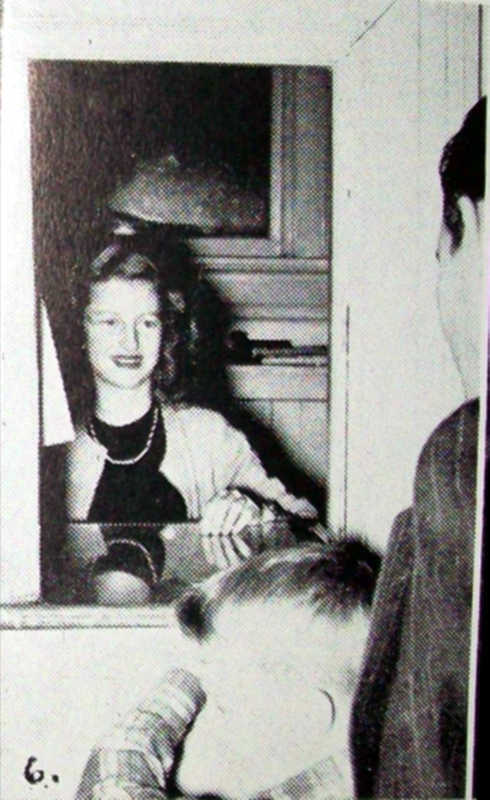 The driver, who is hidden, is Hubert "Pete" Norris, the lady holding the little boy is Lib Norris. The boy is her son Harold. Mrs. Mary Boyd is in front passenger seat and the man behind her is Bowman Broom. Margaret Jean Wisby is behind Mrs. Boyd. The other three women are Bootsie Broom, Betty Boyd, and Margaret Broom. A picture made in 1954 on the square. Some of the businesses pictured are Lomax Hardware, The Co-Operative Mercantile Co., McCanty & Cheatham Clothing, The Press & Banner, Winn-Dixie Grocery, Western Auto, A&P Grocery, Bank of Abbeville, Hall's Grocery, Abbeville Drug Co., The Jewel Shop (later Land's Gift Shop), Maxwell Benson & Bolen Furniture, and McClellan's Five & Dime. Made from the south end of the square in the mid 1960s. At that time, it was the fad to cover the beautiful old storefronts with metal. Abbeville Drug Co. on the left was the home of the Winn Dixie store when I was growing up. 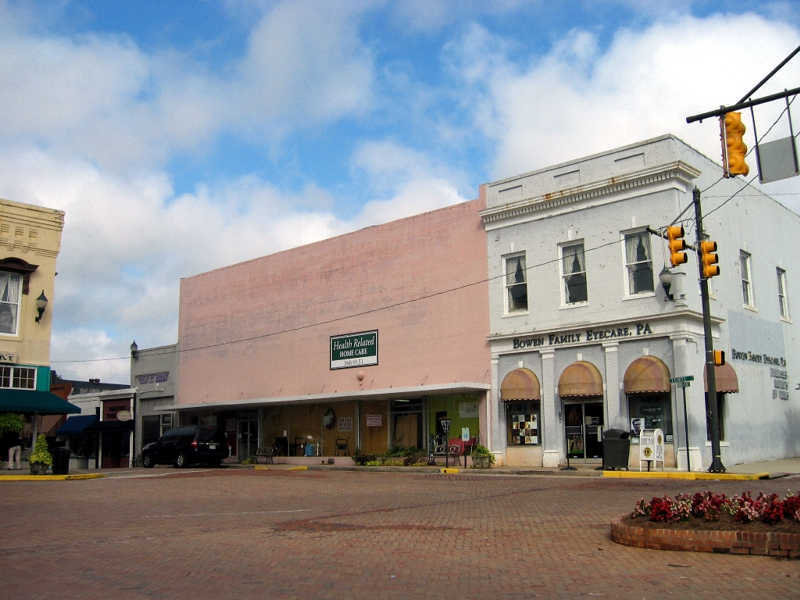 At that time, Abbeville Drug Co. was midway up the square. 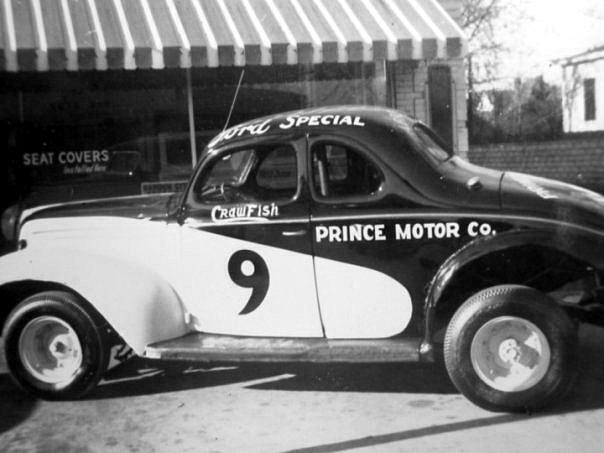 Crawfish Crider's 1937 Ford parked outside Prince Motor Co. To the right, you can see the back corner of Dr. Hill's house. This sad picture shows what was once the Belk Simpson Department Store. It is listed for sale in 2010. The store looks strangely small compared to what I remember it as a kid. My mother worked in the ladies' department on the second floor. I worked part time in the men's and shoe departments on the first floor when I was in high school. Among other things, I washed the inside and outside of the front windows, swept the floors, put merchandise on display inside the windows, and dressed the mannequins. The second floor windows have been covered by the pink facade. Signs on the windows say "Building for Sale" and "For Sale or Lease." The sign posted on the front of the building says "Health Related Home Care." To the right of Belk's was Blake's Cloth Store when I was a kid. It later became Neuffer's Drug Store and then a bank. 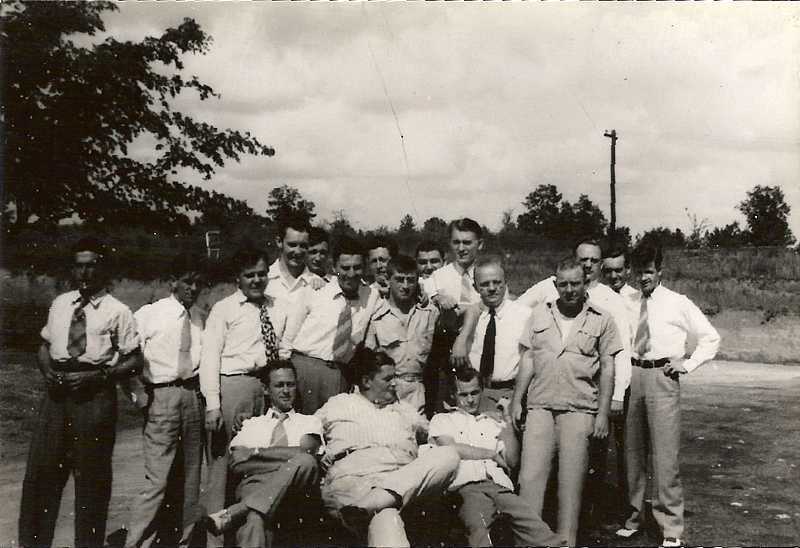 Some of the people who worked at Belk's were Fred Cason, George Link, Julius King, Marilyn Helms, Lila McCaslin, Sara Leach, Sarah Cann, Pamelia Madden, Helen Reese, and Josephine Nichols. The store was open 9 hours a day on Mon., Tues., Thur., Fri., and Sat. and 3 hours on Wed. During Christmas, it was open 12 hours a day. This is another sad picture. When I was a kid, the Dixie Home grocery store was in this building. It became Winn Dixie when I was high school. 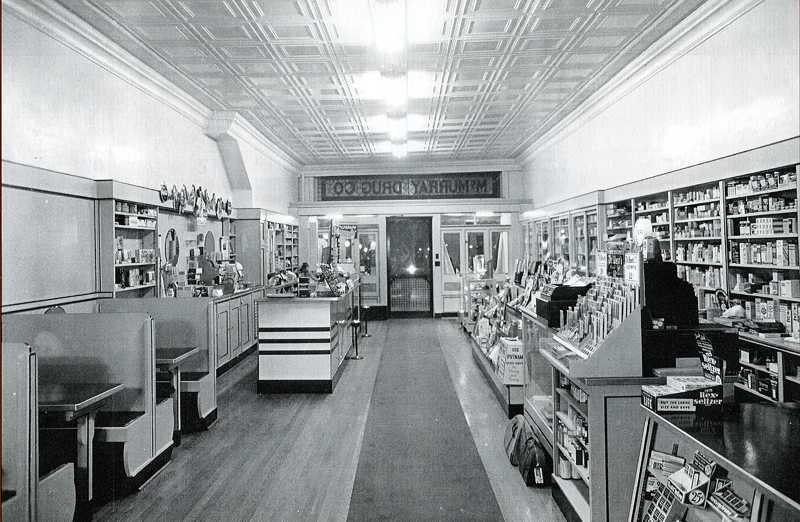 When Winn Dixie moved to South Main Street in the early '60s, Abbeville Drug Store moved into the building. 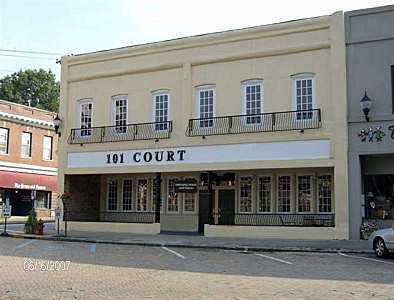 At least two restaurants have occupied the building in the '00s, the last one being 101 Court. It is listed for sale in 2010. The Rough House was listed for sale in 2010, but I read that the owner has said that he does not intend to close it before it sells. It was Hagen Brothers Billiards when I was growing up in Abbeville, but everyone called it the Rough House. Although it was said to have the best hot dogs in town, I was always afraid to go into the place. I understand it is a trendy place to go today. 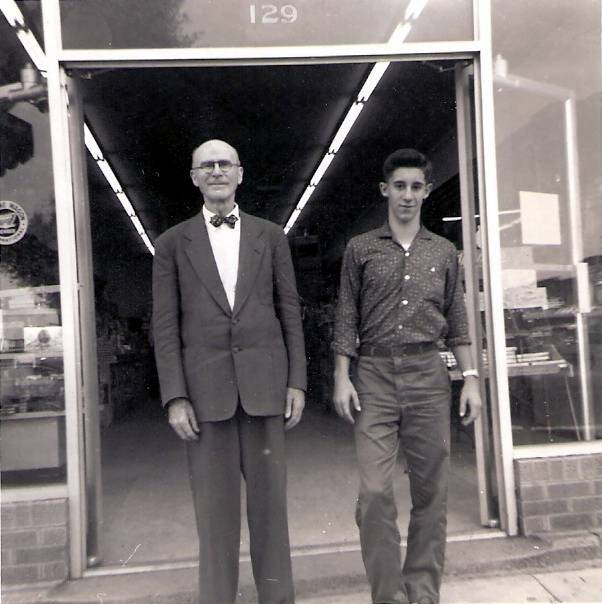 This is a picture of Dr. Austin and Fletcher Johnson, Jr. in front of Savitz Drug Store that was made after Dr. Austin sold the store to Joe Savitz. It was made in the early '60s. 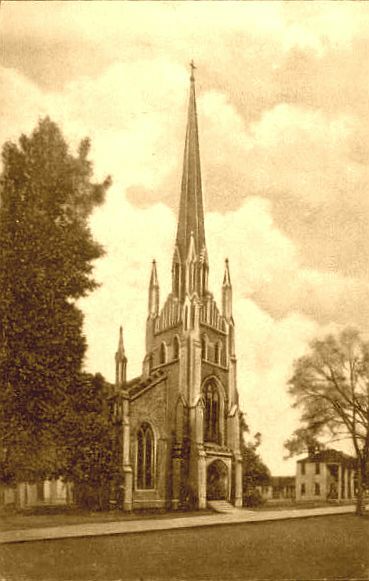 A beautiful sepia tone drawing of the Trinity Episcopal Church that was made in the 1900s. 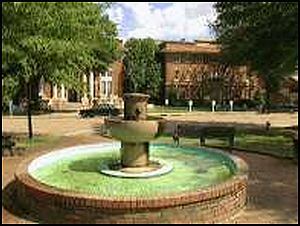 This picture was made from the southeast corner of the square sometime in the late '90s or early '00s. It was taken during the Christmas season. You will notice that the Christmas tree is on the south end of the square. 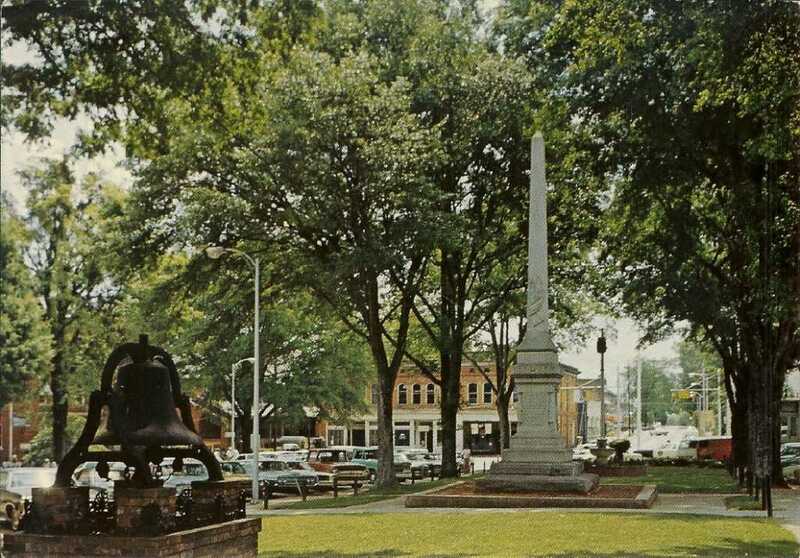 When I was growing up, the city would build a wooden frame around the Confederate Monument in the center of the square and cover it with lighted limbs of cedar trees. This caused a lot of controversy among those who did not approve covering the monument. Erected by the Daughters of the Confederacy in honor of soldiers from Abbeville District who served in the Civil War, the monument had been in place since 8/23/1906. A new monument, hand carved by Italian sculptor Dario Franco Rossi, was erected on 12/14/1996. The person who discovered that the tree was on fire was my first cousin Julia Leach Coleman. She had been away for Christmas. She drove into Abbeville late that night and saw the top of the tree in flames. She went to the police department, but help didn't come early enough to save the monument. 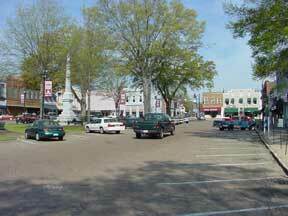 Notice the sparcity of cars on the square. When I was growing up, one had to circle the square several times to find a place to park. At that time the city had parking meters. They have long since been removed when downtown Abbeville fell on hard times. 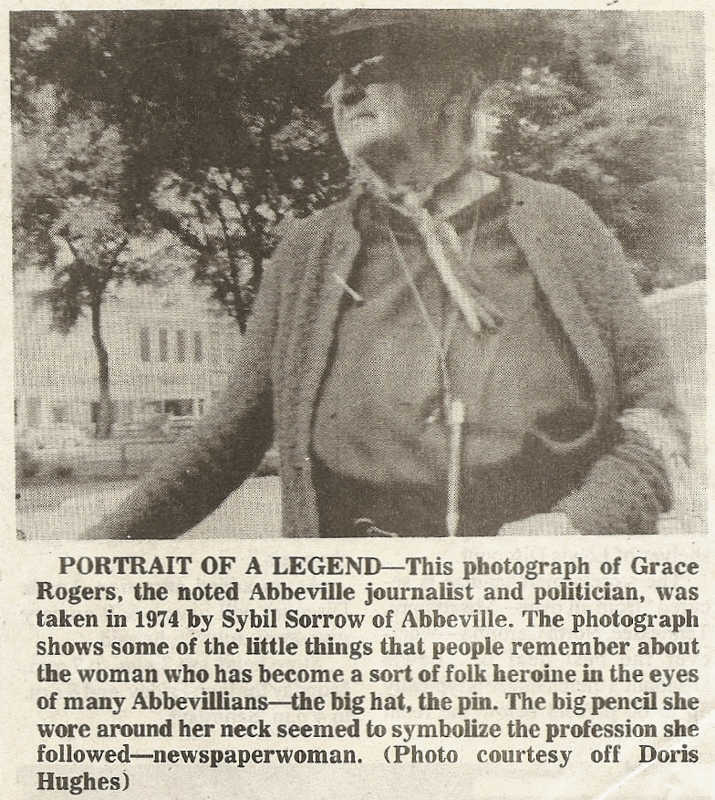 Mrs. Grace Rogers ran for mayor several times in an effort to stop putting the Christmas tree over the monument, but she never won. Grace got her revenge on 12/28/1991, years after she died, when the tree caught fire and caused the top 1/2 of the monument to fall off. Mrs. Rogers was an eccentric lady who lived just off the square in a poorly maintained and vine-covered house that was said to be filled with newspapers. She always had her several mongrel dogs following her every step. 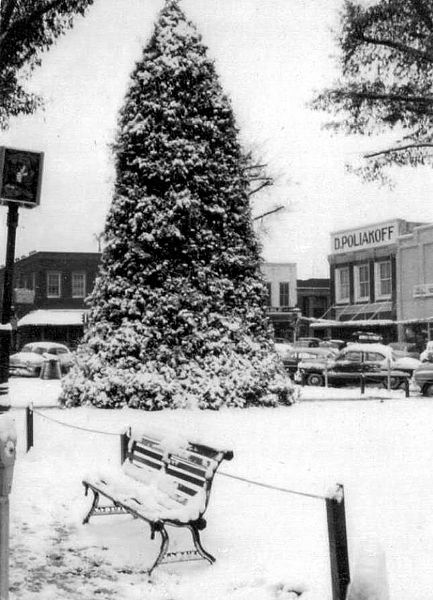 This picture was made during the Christmas season in the late 1950s. It shows one of the trees that Grace objected to. This was once a horse watering fountain located at the south end of the square. It is now the centerpiece of a small pool. In the background are the Court House and Opera House. The fountain is one of 125 watering troughs/fountains presented to communities around the U.S. in the early 1900s by the National Humane Alliance with endowment from Herman Lee Ensign, founder. Minnie Maddern Fiske (1865-1932), actress/activist (husband president of the Alliance) was instigator of the campaign to improve the lot of work horses. She donated proceeds from her performances to fund these watering troughs. 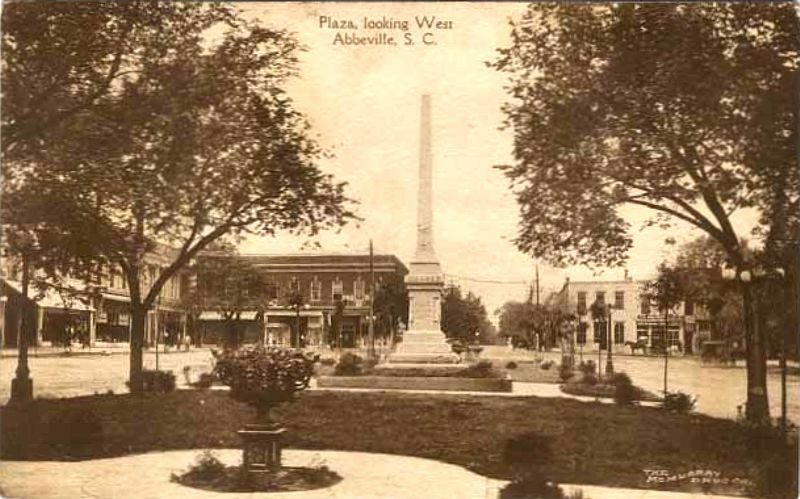 Abbeville's 5-ton fountain, one of few still in its original location, was installed as a watering trough in 1912. It features an ingenious design of water flowing from a lion's mouth into a basin of polished Maine granite trimmed with bronze. The upper bowl was for horses and the small cups at bottom for cats and dogs. A recent photograph made on the square showing the new color motif. The Mexican restaurant is the former Rosenberg's Mercantile Store. Note the restored brick paving. 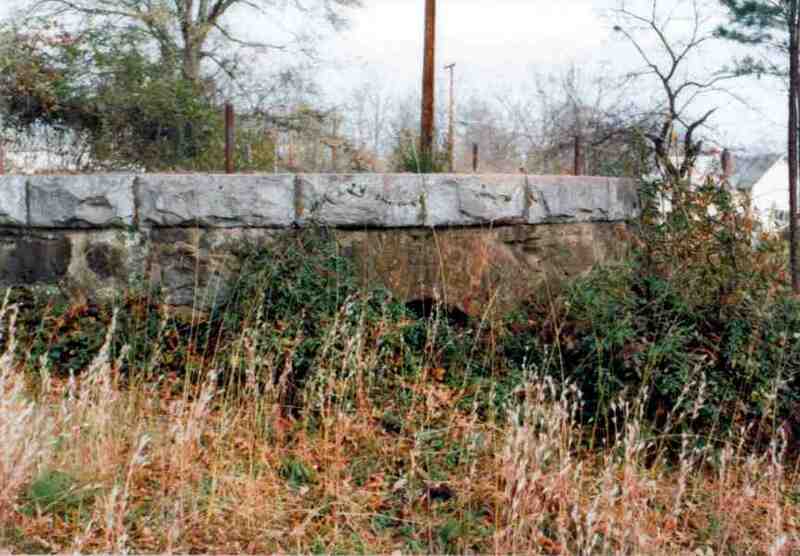 There are several other photos on this page where the bricks appear to be covered with asphalt. 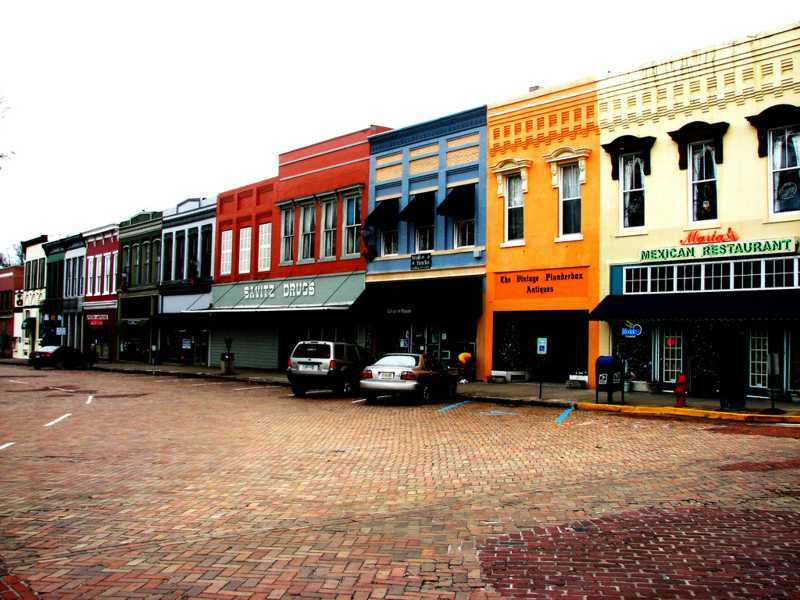 Here is another shot of the east side of downtown Abbeville that was made from the southeast corner of the square. This was made after the fire damaged Confederate Monument was restored with state funds. Notice the lack of cars on the square. We always called it "the hotel." 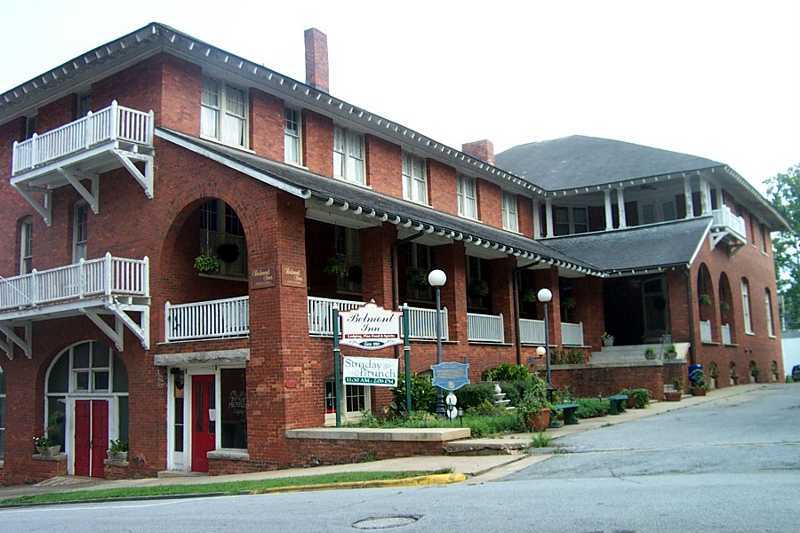 This is a recent picture of the Belmont Hotel. It is now called the Belmont Inn. In 2007, it was listed for sale for $1.5 million. Before it was called the Belmont Hotel, it was known as the Eureka Hotel. This is a post card picture of it in the early 1900s. When I was very young, the train station was a popular place for people to gather on Sunday afternoons. The place would be crowded with people who came down to watch the trains. There was nothing much else to do, for this was before people had television sets in Abbeville. I remember the parking lot being full of cars parked in rows. The adults would sit in the cars and the kids would play on the big baggage carts that were parked along the tracks while waiting for the trains. I remember seeing both steam and diesel engines pulling into the station. There was a post next to the tracks that held a mail bag which would be picked up by trains that were not stopping. 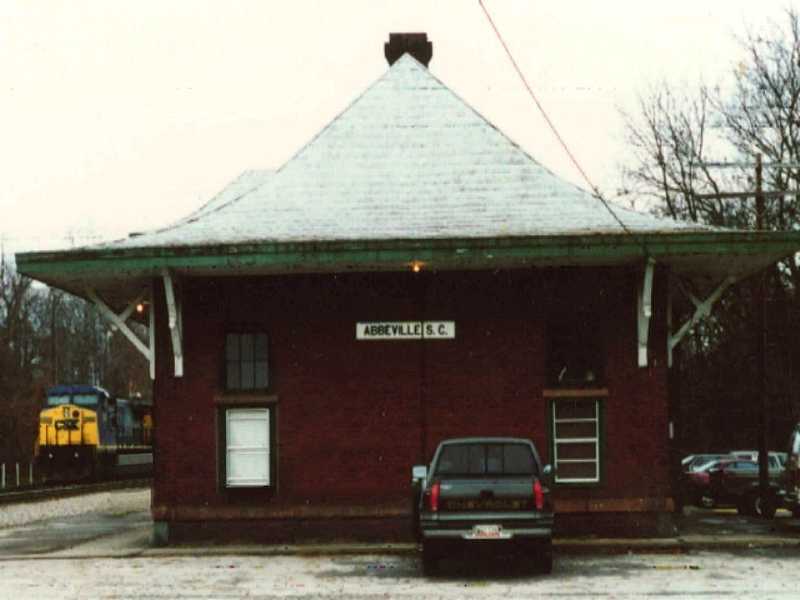 This photo shows the old Abbeville Train Station. At one time, it had a waiting room with ticket windows and wooden benches in the waiting area. 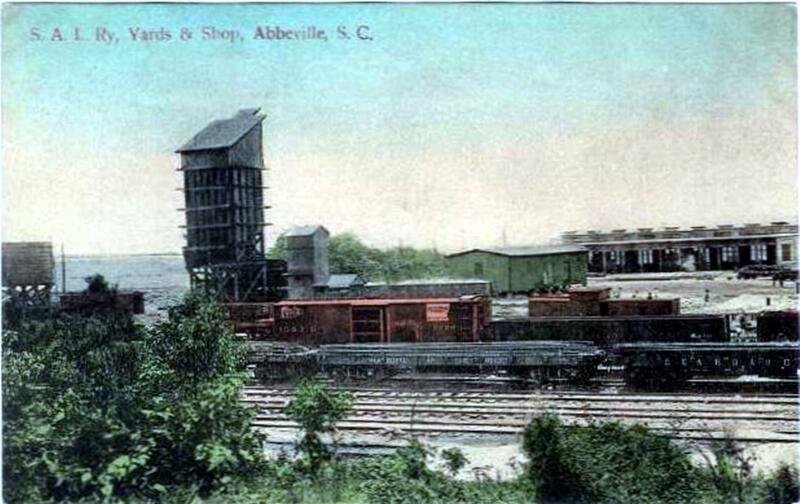 This picture was made long after passenger train service to Abbeville was discontinued. Notice the neat curved roof line. 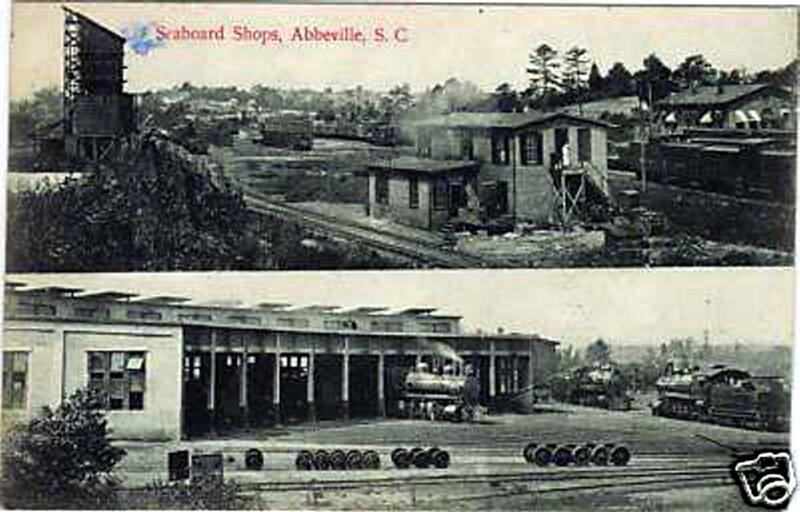 Abbeville once had a thriving railroad industry. 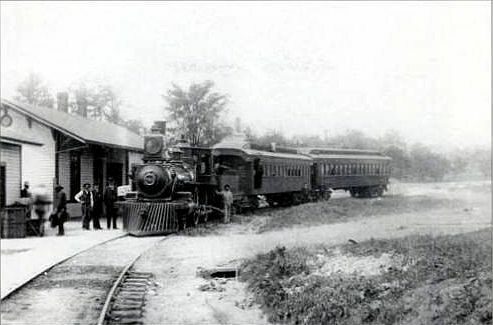 The location that the trains were repaired at was called The Shops. There they had a building called the roundhouse in which the locomotives could be rotated on tracks. Although now abandoned and covered with brush and weeds, The Shops are still there. 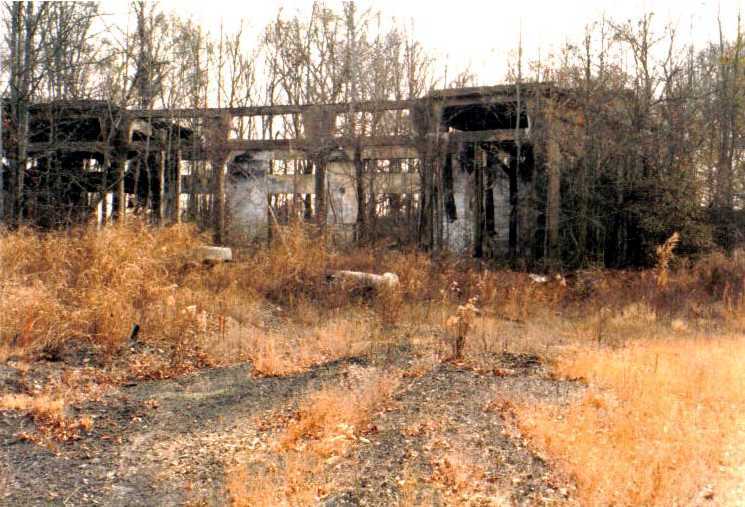 Here is a picture of the roofless roundhouse taken in the early 2000s. This is a picture postcard of The Shops from long ago. I believe the building on the right is the Roundhouse. This is a wonderful old postcard picture of the shops and the roundhouse. 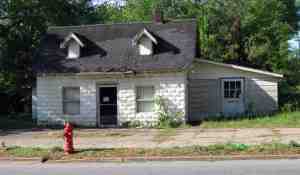 For the first 6 years of my life, I lived at what was then 140 North Main Street. Our telephone number was 74. There was an orchard behind our back yard. Behind the orchard was the Abbeville standpipe to which water was pumped to supply pressure to the city water system. It was a large tall cylinder mounted on a round stone base. Here is a picture of what is left of the old standpipe that was made in the early 2000s. You can see the base with the iron rods to which the standpipe was attached. In the center of the picture, you can see part of the access hole under the standpipe. The area around the standpipe was one of my favorite areas to play as a kid. However, I would never go into the dark access hole. The old standpipe was replaced not long before I graduated from Abbeville High School in 1958. A ritual for graduating classes was to paint "Class of ..." on the standpipe. Our class was the first class to paint the new standpipe. I was not part of the painting party. 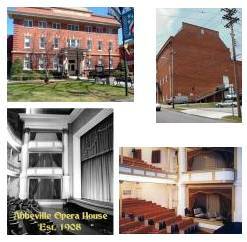 Shown are some pictures of the Abbeville Opera House. Today, it is a community theater. When I was growing up, it was my field of dreams. It was a theater. It opened in 1908 and was originally built as a true opera house where touring companies stopped to perform on their way by railway from Washington, DC, to Atlanta. 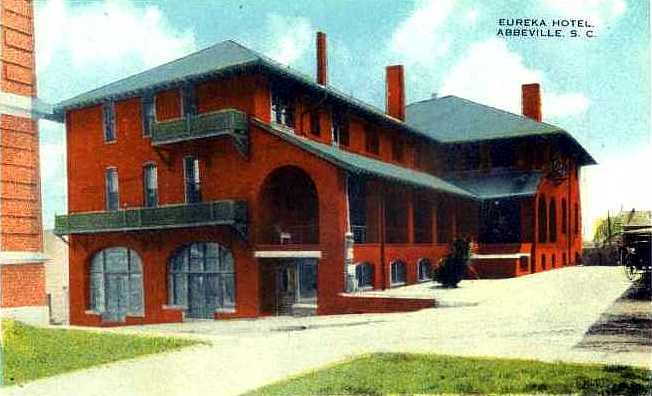 They stayed at the Eureka Hotel, which is now the Belmont Hotel. The upper left picture is of the front. 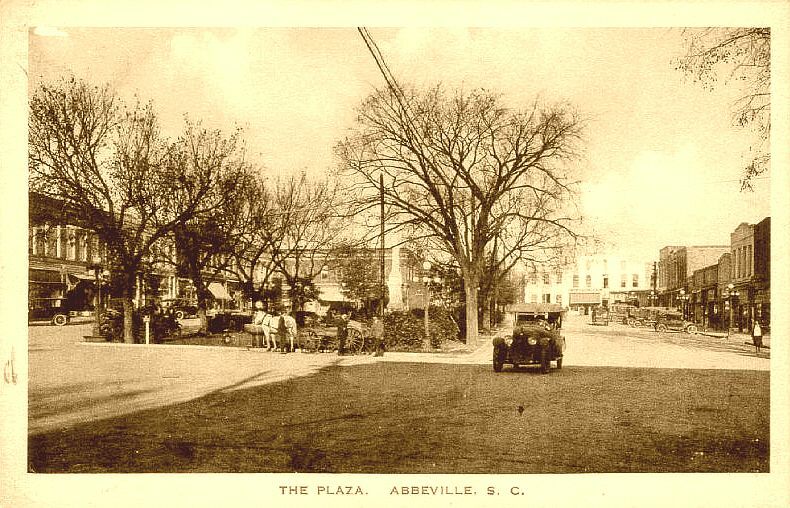 Abbeville city offices and lawyer offices were housed in the front of the building, the theater is at the back. I remember lawyer Bill Greene was in the 2nd floor office directly above the entrance. Lawyer J. D. Mars was in the 1st floor office to the right of the entrance. The upper right picture is of the back. The back wall is the largest un-reinforced solid brick and mortar wall in North America. 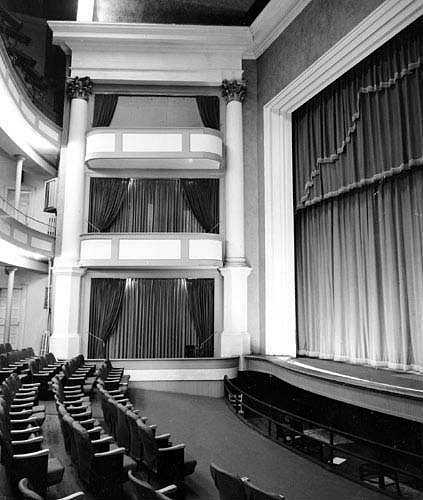 The lower left picture shows an interior shot where you can see the orchestra pit, the curtain over the stage, and the three floors. When I was growing up, only the first two floors were used for the theater. The lower right picture shows the seats on the first two floors. This picture shows less than 1/2 of the total seats on these floors. This is a photo of the interior of the Opera House that shows how beautiful the place is. Can you imagine the seats filled with people watching a movie? I remember when so many people were there that they were sitting in the aisles. We did not have a TV set until I was in the 8th grade. Before then, my friends and I went to the movies at the Opera House as many as 5 times a week. Until I was 12 years old, the admission was only 9 cents. I still remember Mr. Spencer Phillips with his cane taking up our tickets after we purchased them. A bar of candy was 5 cents. A box of popcorn was 10 cents. They later added fountain Cokes. Usually, the same movie was shown on Monday and Tuesday. On Wednesday, you could put your tickets into a box and they would draw one for a prize that night. On Friday nights, they had a late show. I remember people sitting in the aisles during those. Saturday afternoon was the favorite of us kids. There was always a feature such as the Three Stoogies, a cartoon, a serial, and a western movie. We saw Roy Rogers, Gene Autry, Johnny Mack Brown, Lash Larue, among others. All of the kids in town must have been there and we would always cheer when the Three Stogies and the cartoon were shown. This is a picture of Mary Frances Wilson selling tickets at the Opera House. She graduated from Abbeville High in 1949 when I was in the third grade. I am sure she sold many 9 cent movie tickets to me. Most of the time, we rode our bikes to the movie. We were afraid to ride through the square, so we parked our bikes against the front windows of Kerr Furniture Store on the north end of the square. Mr. Kerr never objected to us doing that. I never let my dog Terry follow me to town, but he would sneak behind me and would be lying beneath my bike when I got out of the movie. Once Terry even tried to get into the Opera House. On our way back home, we often explored things. Once we stopped at the Main Street Methodist Church and went in. There were no locked doors that we found, but we didn't dare try to enter the pastor's office. I knew the inside of the Methodist church like a glove because my mother had played the organ when I was young and I used to go there with her when she practiced. Being inquisitive, I explored. The organ was originally a manual pipe organ with a huge lever behind it that had to be pumped manually to supply air to the pipes. An electric air pump had been added by the time my mother played it. The pump was located in a room under the organ that was accesible through a door outside the church. I used to like to turn off the electric pump and try to pump it manually. Needless to say, I was not strong enough to pump enough air. My mother didn't play the organ very long, for I remember Miss Lena Belle Johnson playing it most of the years that I was in school. Before my mother played at the Methodist Church, I remember her playing the organ at the ARP Church on Vienna Street. I was very young and my meories of going threre with her to practice are faint. My favorite memory of the organ at the Methodist Church was the summer Sunday that Lena Belle was out and our guest organist was Mr. Billy Bowie. I had gone home after Sunday school and returned with my mother for the 11 o'clock services. The sancturary windows were open because there was no air conditioning then. As we walked up from the parking lot at the back of the church, we could hear the organ. It was so loud that I thought the roof of the building was going to be lifted. When we entered, there was Billy Bowie at the manual, hands and feet flying over the keys and pedals. I doubt that the organ had ever been played that loud or has ever since. My freshman year in college, the organ at the Methodist Church was remodeled. The all mechanical manual that was attached to the front of the organ was replaced with a remote electric manual that was located several feet in front and to the left of the organ. The organist no longer sat up high where he or she could be seen easily by the congregation. Playing the old organ was like driving a car without power steering and power brakes. The remodeled one had power everything. Electric chimes were added, which I thought were neat. As an aside, if anyone who reads this has never driven a car without power steering and power brakes, you can't understand how difficult driving a car was, especially if it had a manual transmission. This is a picture of what was once the Abbeville Bus Station before it was torn down. If my memory is correct, it was on Spring St. behind the square on the NW side. The building was originally built in 1902 as a flour mill by the great grandfather of Allen Long. After that, the building became a laundry. In 1946, it was converted into a bus station by Charlie Darracott. The Daracotts converted the second floor into a nice residence. The bus station occupied the lower floor. There was a spring across the street that supplied water to what was operated by the city for a short time as a wading pool for kids. Charlie's wife Billie worked with my father at the Abbeville Health Department and she was the only person in town who I would let give me a shot. I had to take a series of about 10 to 20 daily rabies shots as a kid after my parents suspected that I had been exposed to a rabid dog. On the weekends when the Health Department was closed, I remember going to the Darracott's residence and laying on their kitchen table while Billie gave me the injection in my stomach. Their son Mixon was a talented musician in high school (1954 AHS Most Talented Senior Superlative Award) who went to medical school and now practices medicine at the University of Virginia Health System. I remember hearing him playing the piano in their residence and he was quite talented. 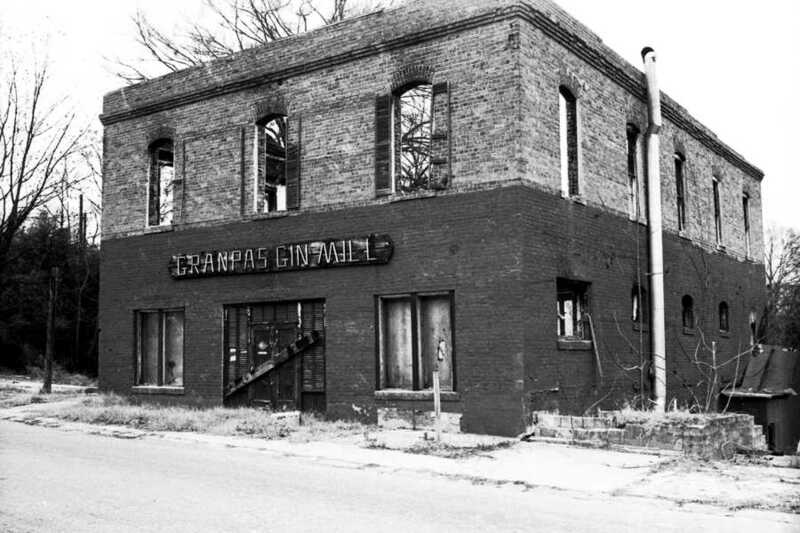 After the bus station closed, the building was converted into Grandpa's Gin Mill. It was torn down after it burned. Abbeville no longer has any bus service. This is a picture taken from the rear of McMurray's Drug Co. when it had a soda fountain and lunch counter. I do not know when this picture was made, but I am guessing it was before 1945. Note the screen door at the front. This was before the days of air conditioning. The soda fountain with booths are at the left. The tin ceiling looks like it has been painted with glossy oil paint. The other drug stores I remember while growing up in Abbeville were Austin's Drug Store and Abbeville Drug Co. Austin's was the oldest. It had a large soda fountain that had a thick granite top. During the hot summers, it felt so good to lean over the cool granite while watching James Hagan scoop ice cream into a cake cone. The ice cream cost 5 cents a scoop. With my 50 cents a week allowance, I usually could afford only one scoop. The soda fountain, the display cabinets, and the furnishings in Austin's looked like they were from the early 1900s. Abbeville Drug Co. was the newest of the three drug stores on the square. Before its soda fountain and lunch counter were closed, we often gathered there after school when I was in high school. I remember eating peanut butter filled crackers called "Nabs" and drinking a cherry fountain Coke. The grilled cheese sandwiches there made a delicious lunch. For some reason, people in Abbeville addressed the druggists as "Doctor." I remember Dr. McMurray, Dr. Austin, and Dr. Agan. When Dr. Austin retired around 1960, he sold his store to Joe Savitz who renamed it Savitz Drug Co. I remember hearing that Joe would keep the original furnishings, but he had them removed and had the quaint old store remodeled. I think this photo was made in the mid '30s on Trinity Street. I believe the store to the right later became Peeler's Pool Hall. It says on the window "Draft Beer by the Mug 10 cents." The store on the left is a pawn shop. Here is a picture made in the '90s of the now shuttered old Mile Rock Filling Station at the corner of N. Main St. and McGowen Ave. It was a Shell gas station and a place where kids in the neighborhood bought bottled soft drinks and candy. Some of the people who ran it were a Mr. Taylor, Billy Evans, and Joe Haralson (Harrison?). Behind it on Henry St. was Laboon's Oil Co. Mr. Laboon delivered kerosene to our house for years. That was before Abbeville had natural gas. People heated with coal, kerosene, wood, or liquid propane gas when I was growing up. A couple of miles up the street from the Mile Rock at the fork where N. Main St. splits into Highways 28 and 71, was a joint called the "Har Lar." Two brothers ran it. Their names were Harry and Larry Clinkscales, thus the name "Har Lar." I think they had curb service in the 1940s, but it was mostly a beer joint when I reached high school. I love old pictures from Abbeville, even when I don't know who is in them. This photo was made outside the Har Lar, probably sometimes in the 1940s. The big guy in the center front is one of the Clinkscales brothers. I hope someone can indentify the other men in this picture for me. Another place in Abbeville that was well known was Bill Calvert's Five Points Grocery at the intersection of Ellis Ave., Ferry St., Orange St., W. Pickney St., and Long Branch St. This place was always open on holidays and after hours, so people went there for milk, bread, cigarettes, etc., if the grocery stores were closed. This was before the convenience stores that everyone takes for granted today. There was a man named Skeeter who worked for Bill. Probably Calvert's main business was selling beer and cigarettes. The place had a dividing wall. On one side were the grocery items. On the other was a bar with stools. The times I went to Five Points, I never ventured into the bar side. The place had a bad reputation, and several shootings happened there. Any "upstanding" people who went there by car didn't dare stay too long, for others driving by might think that they were inside at the bar. Calvert later moved his grocery to Cedar Springs Road. After it was closed, three of his booths ended up in the Rough House and his rotisserie chicken grill ended up in the Village Grill. The building that housed the original Five Points Grocery has now been torn down. Anyone who grew up in Abbeville when I did could not fail to remember Noah's Ark. It was an antique store on Washington St., not far from the square. The It was purchased in 1940 by Robert Hawthorne and the business was established in 1944 by Floyd Hawthorne. I found this picture of the back of a post card on the Internet. It shows three small views of the outside of Noah's Ark. The thing I remember most about the outside was the bathroom fixtures on the side of the building. I was too young to be interested in the antiques inside, but there was a book attic where they sold great used books for young boys like me. The price was usually 10 cents. The books that I bought there were from the old Tom Swift series written back in the 1920s. They were about a boy scientist who invented many marvelous things that fascinated me at least 30 years after they were written. During the summer, it was unbearably hot in the book attic, but I spent many hours there browsing through the books. Noah's Ark burned down, I am guessing that it was sometimes in the 1980s. When I was growing up in Abbeville, there was an old school building at the corner of North Main Street and Wardlaw Street across from the Recreation Center. It had been converted into apartments and was owned by an eccentric businessman whose name was T. Miller. I remember it being in pretty bad shape. I found this post card picture of the building from the early 1900s. 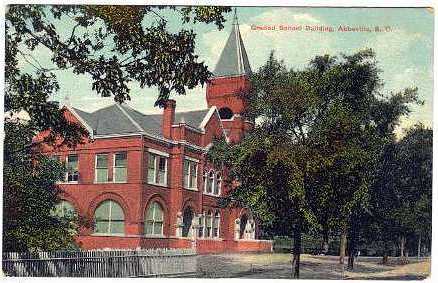 It calls the building the Graded School. The building was torn down, maybe in the latter 1960s or early 1970s. 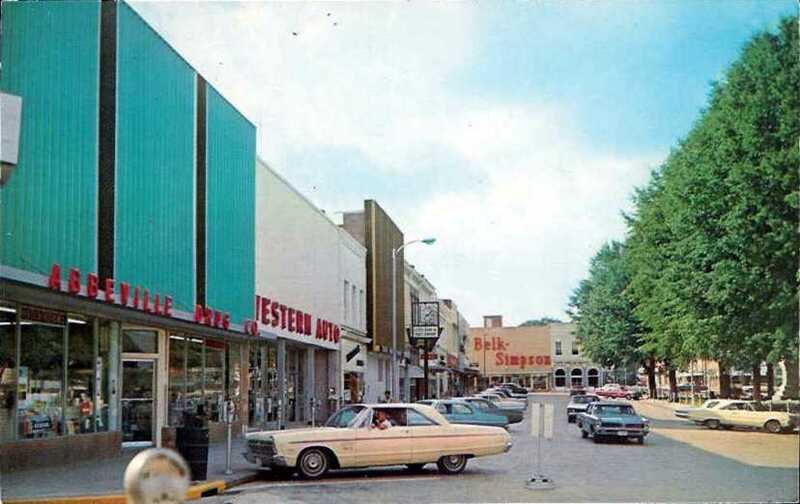 Although I remember it being an eyesore, North Main Street just didn't look the same after it was torn down. For a long time, the Kum Bak was the most popular gathering spot for teens in Abbeville. It was located in what had been a train station at the corner of Washington and Chestnut Streets. The train station was built in 1900. The building became the Kum Bak drive-in restaurant in 1940. In the 1950s, it was common for so many cars to be parked around the Kum Bak that it was hard to find a vacant spot. It was run by Jasper Davis and was closed in 1969. 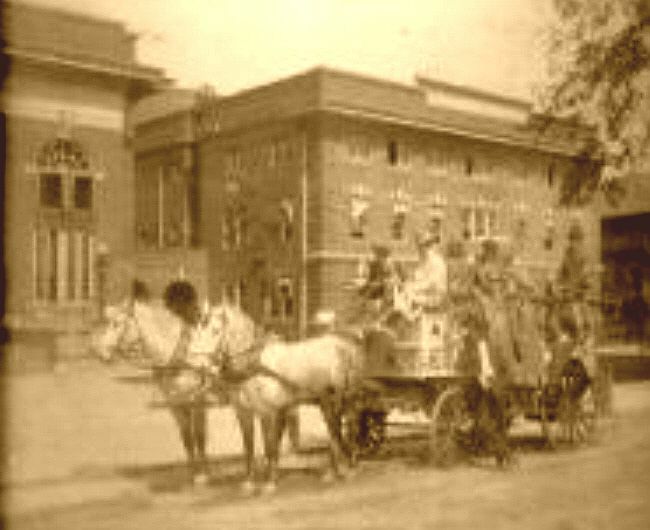 This is an old photo of the building from the early 1900s. 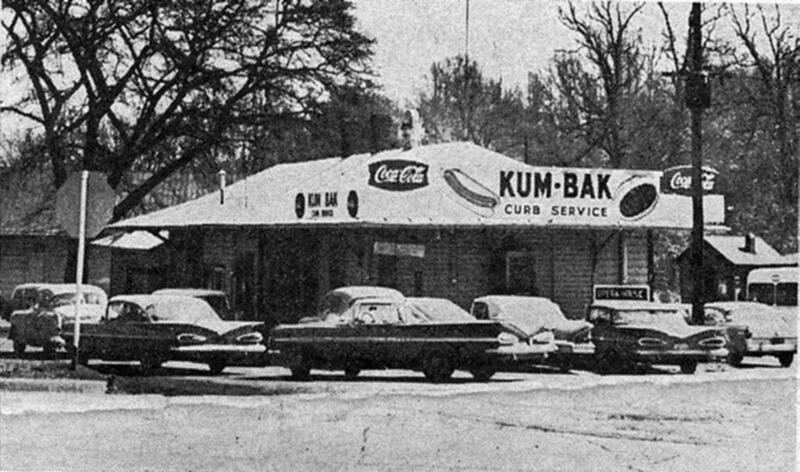 This picture of the Kum Bak was published in the Sunday, March 1, 1964 issue of The Anderson Independent as part of an article about a shooting that had occurred there. It looks like parking space is pretty scarce. Under the word "curb" on the sign on the roof, you can see the evaporative cooler (sometimes called a "swamp cooler") that Jasper used to cool his place. There were a lot of these in Abbeville when I was growing up. I had one in my bedroom that I build from a kit that I ordered from Texas. On a dry day, they did cool the air at the expense of raising the humidity. 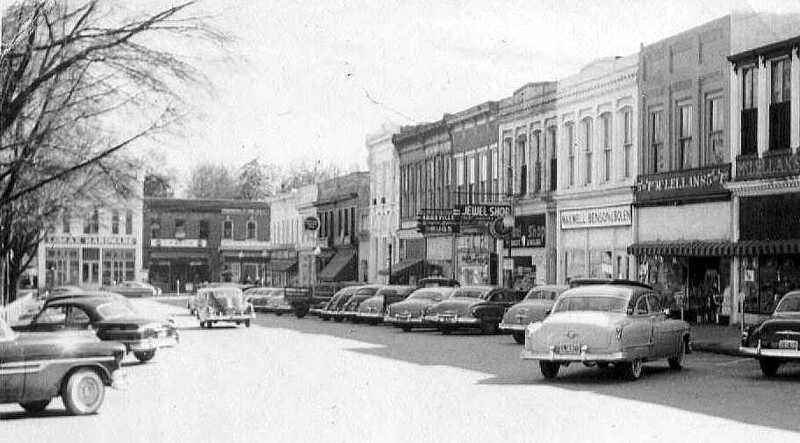 In the picture, there are three 1957 Chevrolets, a 1954 Pontiac on the extreme left, a 1955 Ford on the extreme right, Jasper's 1957 Chevrolet station wagon parked next to the building on the left, and a 1958 Chevrolet in the center right. There is a bread delivery truck on the extreme right behind the Ford. I can't tell what the car behind the center 1957 Chevrolet or the car behind the Pontiac are. I seem to remember that Jasper always wore a full white apron while at work.